CHICAGO — Rookie seventh-round draft pick WR Jeff Janis is active for the Packers today for the first time. 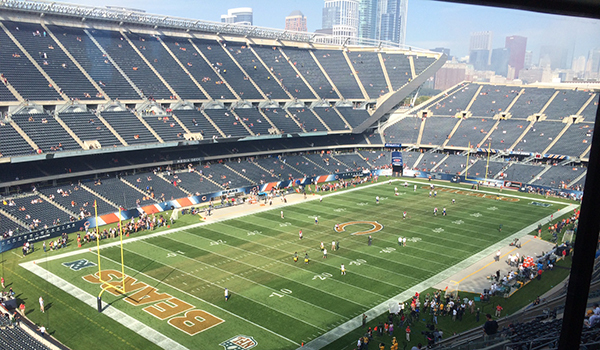 With WR Jarrett Boykin out with knee/groin injuries, Janis will make his NFL debut today at Soldier Field. Janis missed a chunk of training camp early but began to impress during the preseason games, catching TD passes of 34 and 33 yards. The speedster out of Division II Saginaw Valley State is a raw receiver who could also be an option in the return game. LB Brad Jones (quad) is also out for the Packers, so LB Jamari Lattimore will start his third straight game. On the injury front for the Bears, DE Jared Allen is inactive today. He was questionable on the injury report with an illness. DE Willie Young will start in his place. WR Brandon Marshall, who was questionable with an ankle injury, is active and will play. Which RB will break out? : Both Packers RB Eddie Lacy and Bears RB Matt Forte are off to slow starts in 2014. Lacy has just 113 rushing yards through three games, while Forte hasn’t done much more, with just 136 yards so far. Both defenses have had their moments struggling to stop the run, so this game could come down to which running back gets it going. 1-3 or 2-2? : The Packers have been 1-2 and in this same situation each of the last two years, and they’ve won to even their record at 2-2. When was the last time the Packers fell two games below .500 at any point in a season? Check out this week’s “One Last Look” for that and more. In the NFC North: The Bears and Lions enter the day 2-1 while the Packers and Vikings are 1-2. The best-case scenario for the Packers would be to win and have the Lions lose to the Jets, which would create a logjam at 2-2 atop the division. The worst-case scenario would be a Packers loss and a Lions win, which would put the Packers two games back of two division rivals just one month into the season. Weather update: It’s slated to be a beautiful day in Chicago, with temperatures in the low 70s, very light winds and no chance of rain. 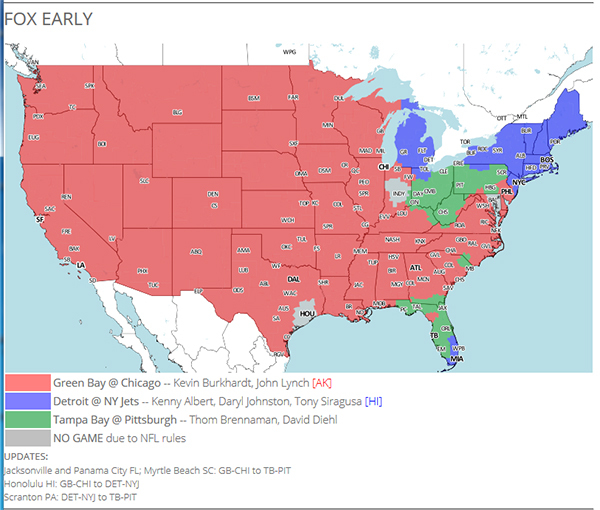 TV map: Here’s a look at where the Packers-Bears game will be shown on TV today.